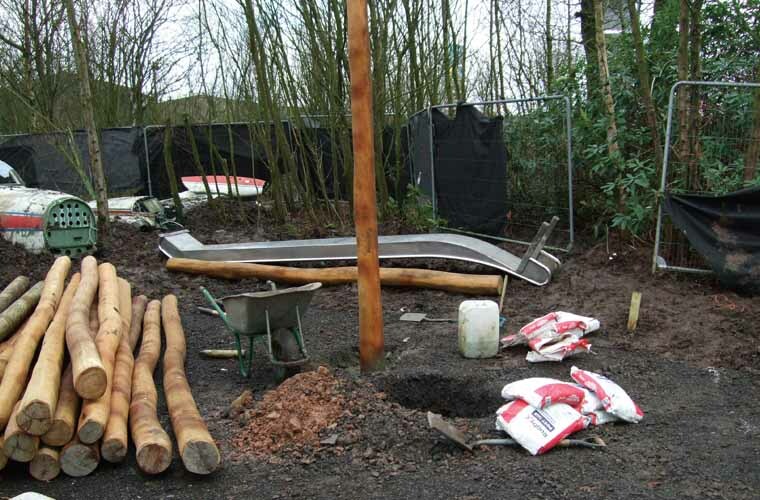 Approximately 5.0 x 4.5m x1.5m high - this is the main access structure positioned around a semi-mature oak tree. These towers connect to the main tree deck and to each other using a selection of bridges. 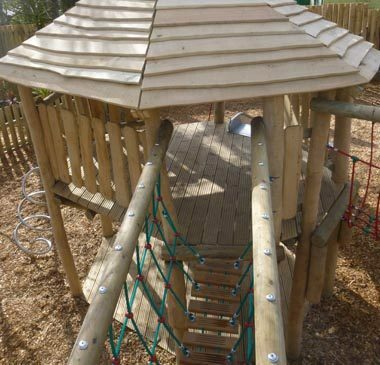 All ages and abilities of children are accommodated with the differing sizes of towers, bridges and access points. A robust timber deck constructed with pressure treated timber joists dressed with redwood decking, mounted on a metal frame to fit the container. All the towers have robinia timber legs with machine rounded timbers to support the deck platform timbers. Each of the tower will have balustrades which are constructed of wany edged Robinia boards, (not straight edged), timbers balustrades supported by half round timber railings. To accommodate the different weathering effects on the tree and the platform structure and any major branches. 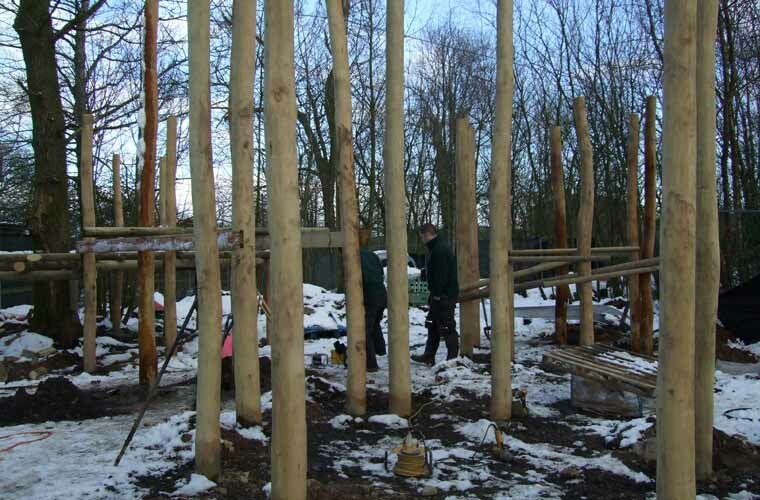 To minimise the removal of bark at points of contact with the structure and use as few fixing bolts as possible. To make every effort to ensure there is no damage to the tree that may affect the strength or health of the tree. All holes were hand-dug to minimise any damage to the roots. Any old, broken or deceased branches removed to ensure the platform is safe to use. 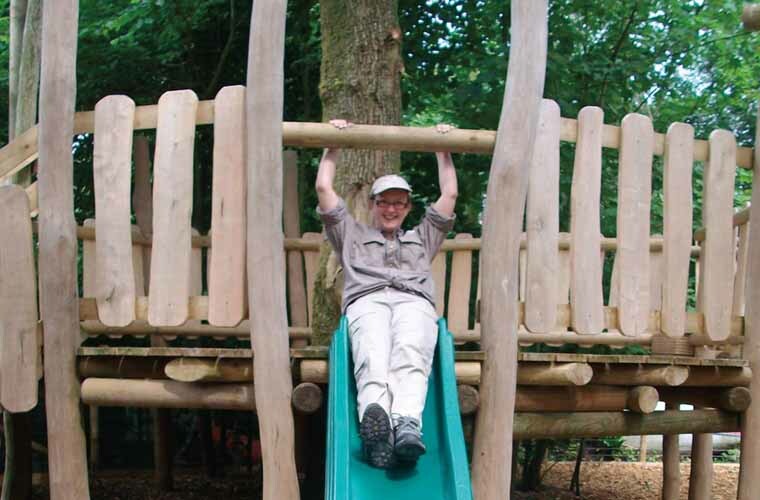 The play equipment has proved to be a popular further attraction to the park and is an asset to the area making it an even more attractive destination for families for a day out. 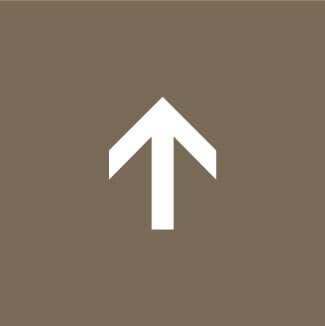 All equipment conforms to European Safety Standards EN-1176 & EN-1177, but being as natural and in keeping with the rural setting while being robust and durable with minimal future management and maintenance – limiting future on-going costs. This is a woodchip and bark mix to blend well into the surroundings as well as lessening the risk of injury should a person fall. 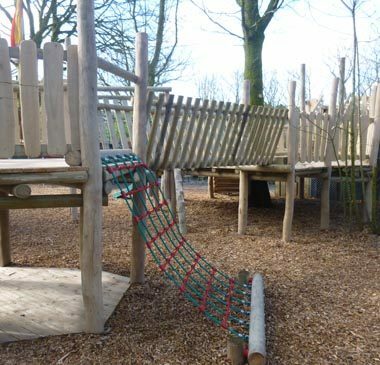 Caledonia Play were happy to advise on ongoing after care and maintenance and are able to offer an annual inspection service. Hetland Garden Centre’s Dino Park is a popular attraction for families. 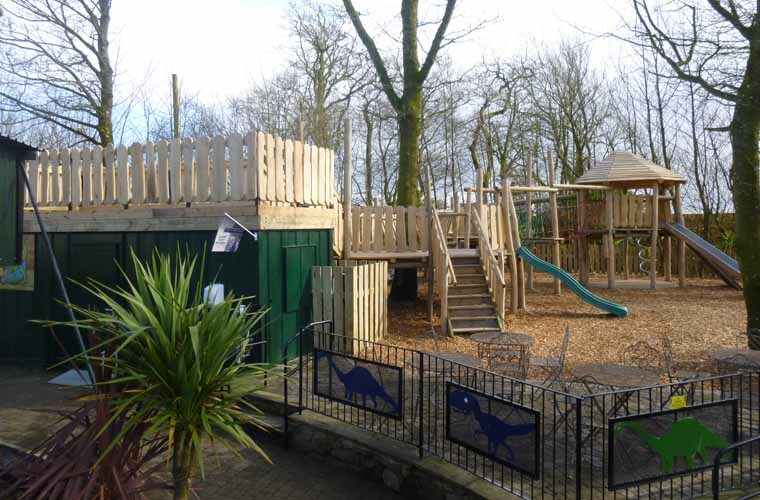 Situated near Dumfries the park offers a large range of activities for children and adults of all ages. 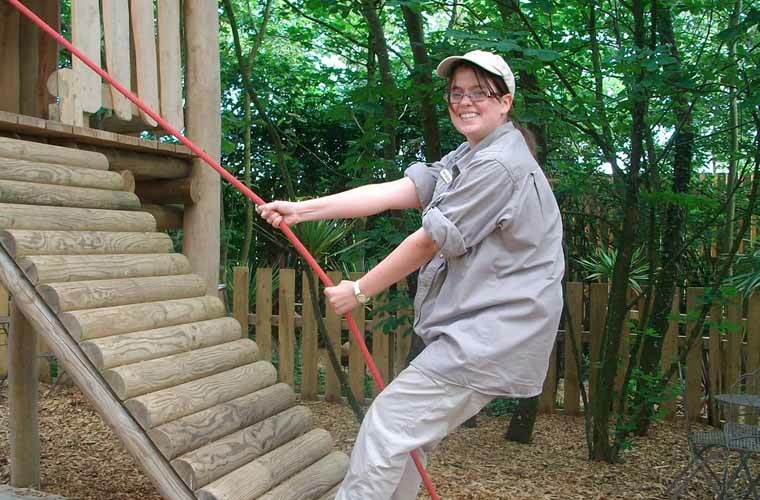 The park also promotes themselves as a venue for school trips and birthday parties. They supply quizzes, crafts, activities and lots of fun play too. The day can be tailored to suit the class and age group of the children. 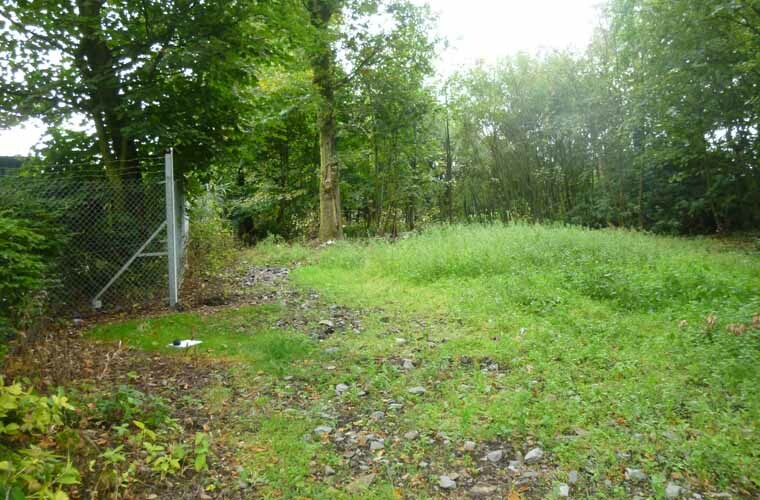 The owners were looking to develop their outdoor play area within a woodland area behind the Dino Park. 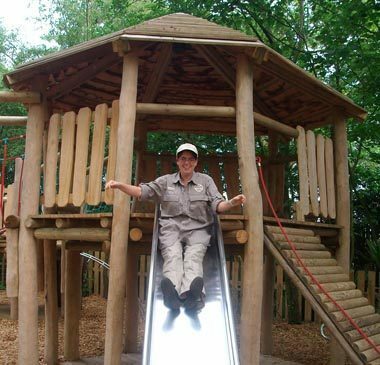 After working carefully with the clients Caledonia Play proposed a fantastic bespoke-built timber play area built around an existing oak tree that would have minimum impact to the woodland setting and be an asset to the site. The structure was designed so that in future more elements could be added as required. Throughout the park there are large dinosaur models that add to the adventure element of the park. 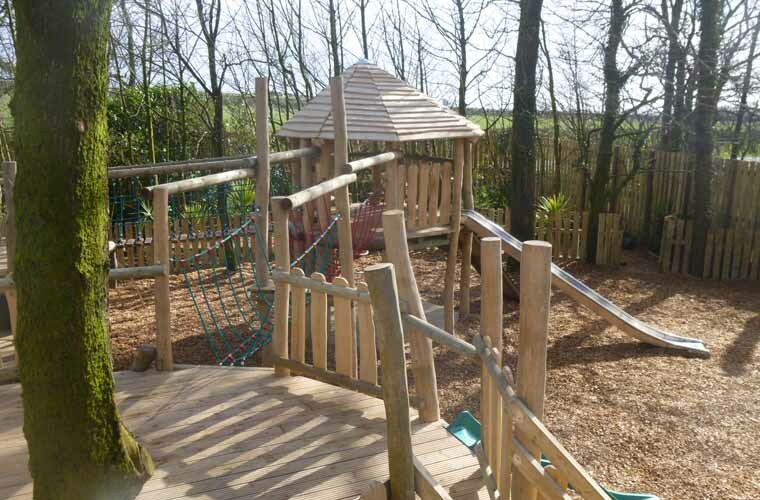 The play area is a very welcome extension to the theme and is ideally located to tire the children out by giving them lots of opportunities to be active, to climb, run about, slide and generally have a blast! The proposal was to build a tree deck around an existing oak tree and then connect it to further platforms and a viewing deck over an existing small building. There were to be a large range of exit and entry points to all the towers. 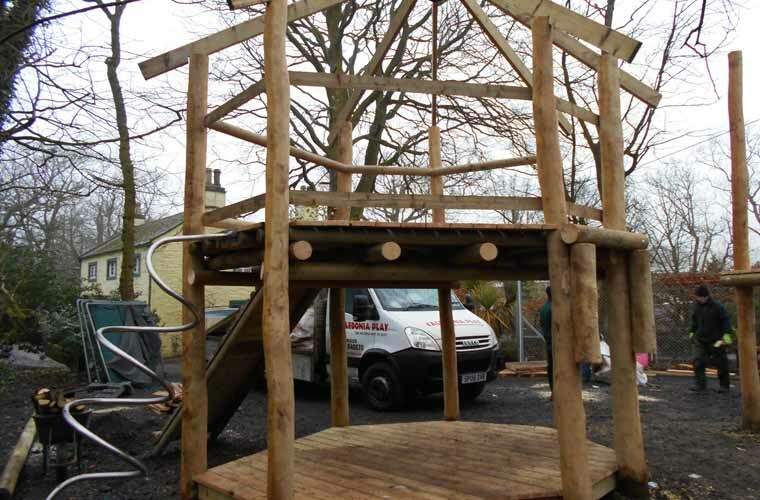 We were pleased to be able to offer more unusual exit and entry points rather than just a ladder and a slide. 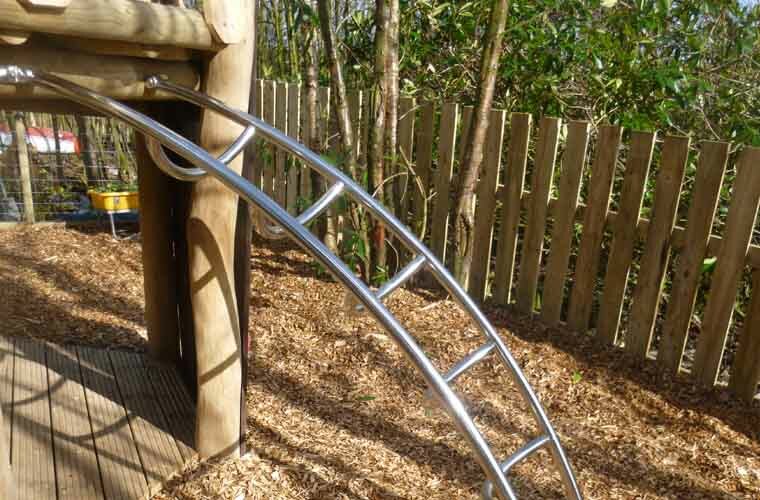 We offered bespoke climbing walls, spiral ladders, curved stainless steel ladders and large super stainless steel slides. By offering something a little more unusual the children would be entertained for much longer and the whole play experience would be far more memorable. All the towers were to have robinia timber legs with machine rounded timbers to support the deck platform timbers. Each of the tower would have balustrades constructed of wany edged Robinia boards, (not straight edged), timbers balustrades supported by half round timber railings. Robinia is a hard wood that retains the natural shape of the tree, so it blends well with the natural environment. It is vandal-proof as the dense nature of the wood makes it difficult to cut or burn. 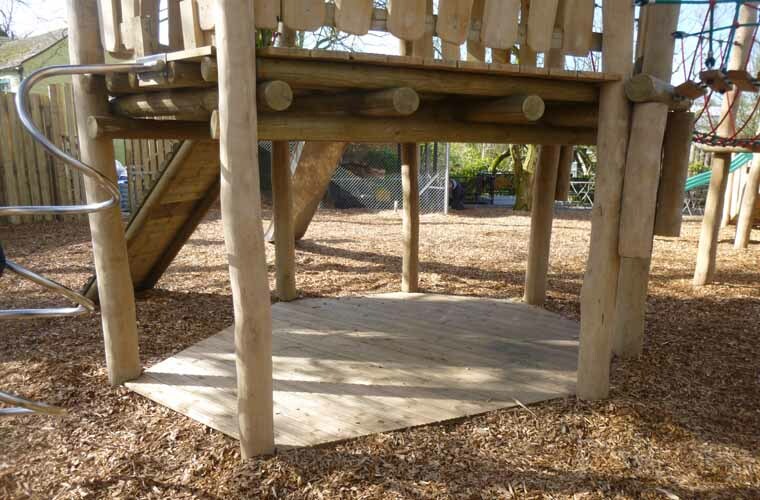 Robinia timbers also do not require a preservative to be painted on or impregnated into the timber and this in turn means that there is less on-going maintenance.